Boss Man and Cat Daddy | Oh Danny Boy! I had the pleasure of taking Robert to his cancer treatments over a year before he passed away. At one time we went 10 consecutive days. You try and not become friends of your patients but it’s almost an impossible when you spend 3 to 4 hours a day with them. Robert told me stories of his children and his work experience. He was so proud of their achievements. Robert was an entrepreneur even though he probably never used the word. He had a catering business where his sons helped him and he also coordinated bus tours to places like Atlantic City an Atlanta. He said he went by the name of “Boss Man”. After a few weeks Robert turned to me a said “I’ve told you a lot about myself and I know very little about you.” He said, “Do you have any children?” I said “No, I don’t Robert but I have five cats. He said, then I have a nickname for you. From now on you will be know as “Cat Daddy”. He had a friend who made us two baseball caps (above). One said “Boss Man” and the other said “Cat Daddy”. 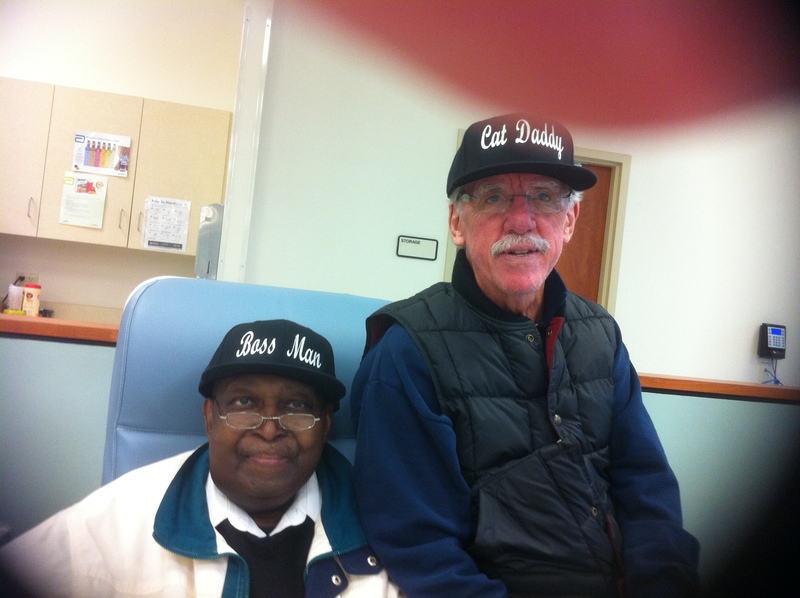 From then on when we went to the Cancer Center he would announce to everyone in the waiting room: “Boss Man and Cat Daddy have arrived”. This entry was posted in People, Photos and tagged Cancer, Friends, Photos by Danny James. Bookmark the permalink.